Painted turtles are often seen basking on logs in the river. Many of the animals that live in the river's riparian buffer are harder to find. Water quality is essential to sustain animals that rely on aquatic habitats for food and reproduction. Many animals spend their whole lives in the river, or within the riparian buffer under rocks and underground. When you walk along the river, keep your eyes open. The variety and location of wildlife can be surprising. Please email your wildlife questions, stories, or images to wildlife@chicagoriver.org. Learn about Friends' projects to create habitat for turtles. Click on a type of animal to jump to that section. Amphibians and reptiles (collectively known as herps) may occupy similar habitats and can be found in most habitat types. Some species use different habitats at different times of the year. 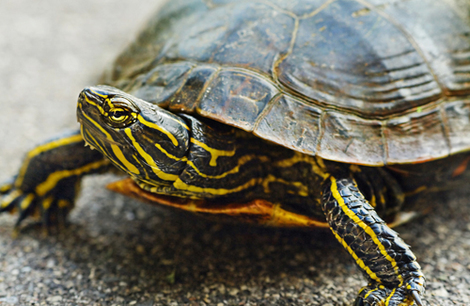 Some turtles, for example, spend most of their time in the water, but must move to land to lay eggs. 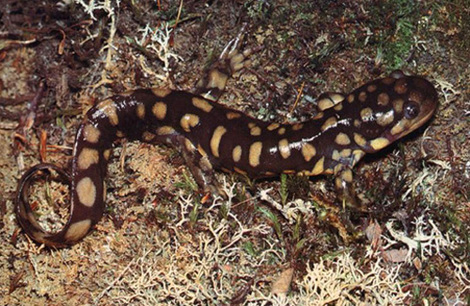 Amphibians and reptiles are both important members of aquatic and terrestrial ecosystems. Both groups serve as both predators and prey, and species that inhabit both ecosystems serve to transfer energy between the two systems. Both reptiles and amphibians cannot regulate their own body temperatures internally as mammals and birds do. They each have ways to stay warm such as basking in the sun, and by hibernating underground or burrowing into the mud to survive the winter. A tiger salamander has spots to camouflage itself against the forest floor. The Illinois Natural History Survey has a comprehensive guide for Illinois reptiles and amphibians. These shy creatures are seldom seen, but almost always there. Listen for frogs calling in the spring. Some common reptiles and amphibians are highlighted below. River Life Stories: Blanding's turtle, common garter snake, common snapping turtle, Massasauga rattlesnake, and northern green frog. Some macros spend their whole life cycle in the river. Others emerge to live nearby. Macroinvertebrates are animals without a backbone that are large enough to see with the naked eye. In the river, they include animals from such varied groups as insects, crustaceans, worms, and mollusks. As well as comprising an important part of the aquatic food web, macroinvertebrates are also key bioindicators of water quality. 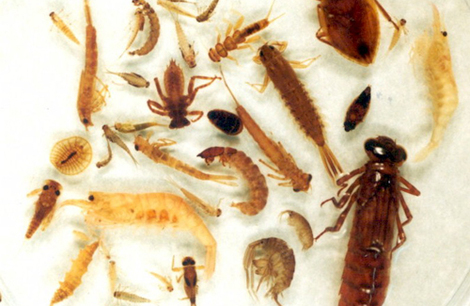 Some macroinvertebrates are highlighted below. 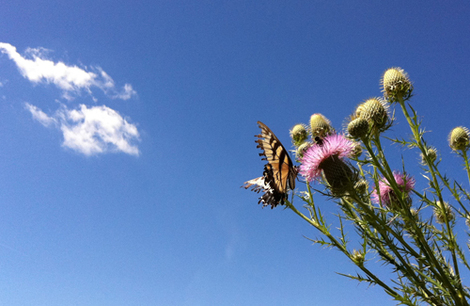 A tiger swallowtail butterfly sips nectar from a Canada thistle. Calling something a "bug" usually implies a pest or disease carrier, like a mosquito or tick. Many insects like bees, butterflies, moths, and beetles are beneficial to humans; they pollinate plants, produce useful substances, control pest insects, act as scavengers, and serve as food for other animals.